The Lighthouse Bed & Breakfast Inn offers a restful escape, embellished by incomparable sunrises and sunsets over Lake Superior's North Shore and a close-up view of harbor activity. You can bask in the historic flavor of this turn of the century building then explore the diverse recreational opportunities and wealth of year-round natural beauty the North Shore has to offer. Built in 1892, the Two Harbors Lighthouse is listed on the National Register of Historic Places and is a working Lighthouse. 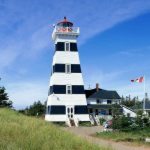 Guests become assistant lighthouse keepers and in the tradition become registered keepers of the light during their stay. As Assistant Lighthouse Keepers, guests contribute to the preservation of this historic lighthouse. Guests learn about the history of the Lighthouse and can participate in helping to maintain the Light Station. 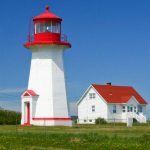 All proceeds are applied to the restoration and maintenance of the lighthouse. A landmark beacon on the Hudson River, the Saugerties Lighthouse is a venerable red-brick lighthouse built in 1869 at the mouth of the Esopus Creek. 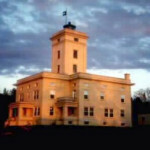 The Saugerties Lighthouse Conservancy maintains the lighthouse and adjacent lands for the enjoyment of the public. Experience a bygone era. Enjoy swimming, picnicking and bird-watching. The Lighthouse can be reached by boat or via the half mile nature trail at the end of Lighthouse Drive in the village of Saugerties, New York. Discover Michigan's best kept secret. 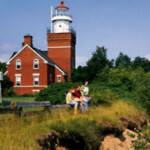 Newly renovated as a bed and breakfast on the magnificent Keweenaw Peninsula, Sand Hills Lighthouse Inn now welcomes you to a memorable experience. Furnished in Victorian charm, this historic building summons you with an original lens and nautical lighthouse artifacts, as well as many antiques, oil paintings and photographs. Direct Chesapeake Bay-frontage. 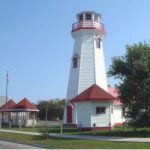 Stay in a real working lighthouse, the Sharps Point Light (Coast Guard sanctioned and N.O.A.A. charted) a full size replica of a typical 1875 cottage style lighthouse. 300' pier. Located just 6 miles east of the historic district and US Naval Academy. Three luxurious bed and breakfast queen-bed rooms with in-room full private baths. Individually controlled climate control, and expansive Bay views. Includes continental plus breakfast. Near the San Francisco Bay area towns of Point Reyes Station and Inverness, providing romantic lodging in a luxurious tree house located near the Point Reyes National Seashore and Lighthouse, one hour from San Francisco and the California Wine Country. The Lighthouse Inn - on Cape Cod, MA, picturesquely situated along the shore of Nantucket Sound. Popham Beach Bed and Breakfast - Not a lighthouse, but a converted lifesaving station. 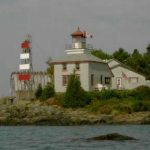 With views of the mouth of the Kennebec River, and Seguin and Pond Island lighthouses. 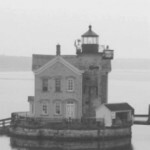 Borden Flats Lighthouse is located at the mouth of the Taunton River and maybe rented out but beware that the lighthouse maybe be haunted with 3 ghosts., Borden Flats Lighthouse has protected the waters of Mt. Hope Bay and Fall River for well over a century. On October, 1 1881 the lighthouse became active with a fixed red light from a 5th order Fresnel Lens. 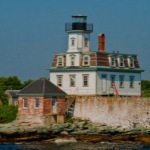 This famous twin light station off Rockport, MA offers stays at an apartment in one of the keeper's houses. 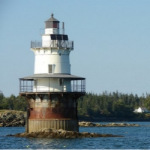 This pretty lighthouse in Pocasset on Cape Cod is available for rent. You can find information on bed and breakfasts in Newport County, Rhode Island, at the website of the Newport County Bed and Breakfast Association. Rose Island Lighthouse - Newport, R.I.
Selkirk Lighthouse - Pulaski, N.Y.
Sebasco Harbor Resort - Part of this resort on the Casco Bay is modeled to look like a lighthouse, with rooms inside. A unique country inn, located 3 miles NW of historic Dubuque, Iowa, perched high on a hill overlooking the rolling hills and valleys of the Tri-State area (Iowa,Wisconsin and Illinois) and the Mississippi River, with miles and miles of views by climbing to the top our 61 foot, full scale, authentic Lighthouse. A four seasons inn offering charm, nature, hospitality and a quiet nights rest. Partake of the inn's many amenities or just relax in front of a crackling fire with a good book from our library(1200 volumes). This is "one of four lighthouses built along the northern coastline of Washington state to guide ships through the Strait of Juan de Fuca. 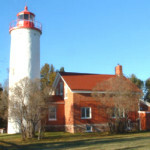 Guests serve as part-time lighthouse keepers and are asked to do light maintenance chores. It is spectacular isolation at the tip of the nearly 5-mile-long Dungeness Spit." The Points Northeast Historical Society runs a Keeper's Cottage Program for those who would like to serve as "keeper." Located in a park in Tacoma, Washington. 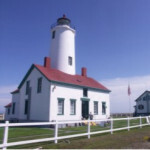 The Point No Point Lighthouse, built in 1879, is considered to be the oldest lighthouse on Puget Sound. 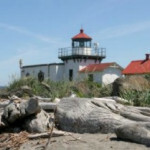 Now, with the cooperation of the U.S. Lighthouse Society, Kitsap County Parks and the Friends of Point No Point, the historic lighthouse Keeper's home has opened as a vacation rental. Located in Fort Canby State Park, Ilwaco, Washington. Two of the keeper's residences are available as vacation rentals. 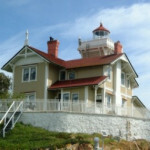 Point Robinson Lighthouse - The Keepers of Point Robinson Lighthouse have opened one of the keepers' houses for weekly rental. In the Vashon-Maury Island Park & Recreation District, Puget Sound, Washington. Email lynchjanet@comcast.net for more information. A bed and breakfast inn perched atop an island in the straits that separate San Francisco and San Pablo Bays. Perched on the California coast, 50 miles south of San Francisco and next to Highway 1. Operated as a hostel. 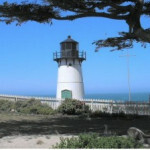 Point Cabrillo Lighthouse - A keeper's dwelling and work sheds here have been transformed into B&B cottages. On the shore of Orca Inlet in Cordova, Alaska -- a barge with its very own lighthouse and a bed and breakfast inn. A six-acre island in Alaska; a great place to watch eagles and whales. For information contact the Gastineau Channel Historical Society at 907-586-5338 or by email at glrrlg@alaska.net. 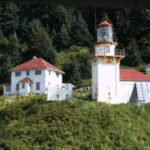 Rockwell Lighthouse - A privately-built lighthouse on the north side of Sitka Harbor, Alaska. Operated as a bed and breakfast; see this page for more information. Captain Charlie's Station - These three former keeper's houses were once part of the Cape Fear Lighthouse Station on Bald Head Island, North Carolina. Their name is in honor of Keeper Charles Norton Swan, who lived at the station for over 30 years. The lighthouse no longer stands. When you go to the website click on "vacation rentals," then click "browse homes," then look in the list for "Captain Charlie's" 1, 2, and 3. The Cove Bed and Breakfast - Relaxing getaway offering lodging in six rooms with private baths, balconies and views of the 1823 Ocracoke Lighthouse and Pamlico Sound. Ideal for weddings, parties, retreats, and business meetings. 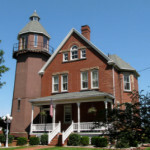 Chesapeake Bay Lighthouse Bed & Breakfast - Located just 6 short miles from historic Annapolis, a full size replica of a typical cottage style lighthouse. Smithfield Station Lighthouse Suites - The lighthouse is a reproduction of the lighthouse from Hoopers Strait in Maryland and that is now a part of the Maritime Museum in St. Michael's, Maryland. As far as we know, it is the only Lighthouse in Virginia where you can spend the night. There were several lighthouses similar to ours in the James River, but they have all been destroyed. We used the Maryland lighthouse as a model because we could touch and measure it to make sure of certain exterior details. It was completed and occupied in December of 1994. 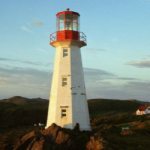 Links to popular lighthouse websites around the world. 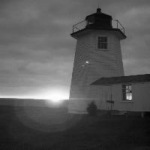 History, locations, photos, lighthouse keepers, artwork, collectibles, and more! Some of these sites include more extensive lists of links that will keep you glued to your computer for hours! I began photographing these guardians of the coast around 1986. 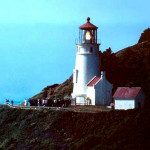 I am a member of many lighthouse societies and organizations whose main objectives are to preserve and restore the lights of the United States and other countries. One of my goals is to capture and preserve as many as possible on film so that they can be shared by all.